Premier Rachel Notley toured the Peace over the weekend making campaign stops in support of several local NDP candidates running in the provincial election. 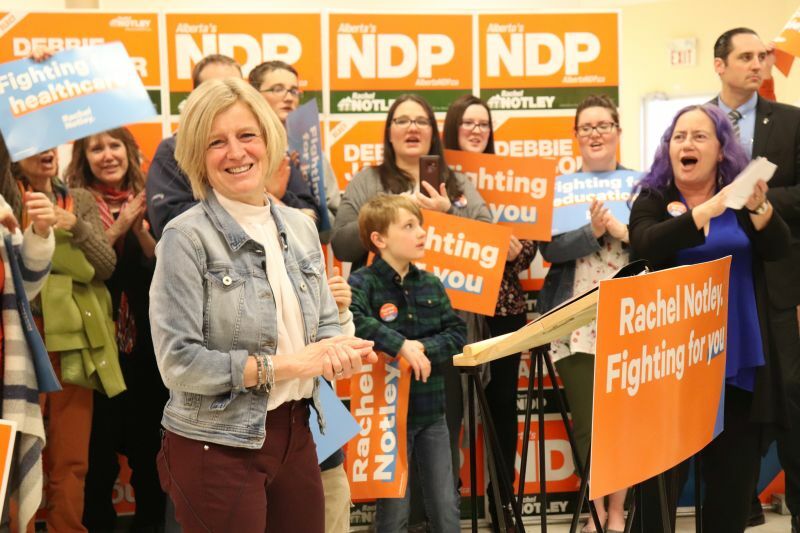 Notley spoke at Debbie Jabbour’s Peace River campaign office in the old Sears building on April 6 to an enthusiastic crowd of over 100 supporters. She also made campaign stops in Grande Prairie, in her hometown of Fairview at Dunvegan-Central Peace-Notley Marg McCuaig-Boyd’s campaign office, and in Slave Lake at the Friendship Centre with Danielle Larivee. Notley pointed to her government’s decision to authorize Grande Prairie Regional College (GPRC) to begin the process of granting degrees as one example. “We’ve invested in GPRC to turn it into a university because I know what it’s like to have to drive six hours to go and get a university degree. Don’t you want to be able to stay in your community, and get the education that you need?” she said. Notley added her government’s investments in infrastructure were also made with the north in mind. The government of Alberta recently announced $80 million in future royalty credits for construction of a new methanol plant near Grande Prairie as part of a made-in-Alberta strategy to support diversification in the energy industry. Nauticol Energy is set to start construction on the $2-billion plant with an opening set for 2020. The project is expected to create 3,000 jobs. During her speech to the assembled crowd in Peace River, which was also livestreamed online, Notley highlighted the construction of a new Peace River bridge as a major local accomplishment for incumbent Peace River MLA Debbie Jabbour and for her government. Notley recalled looking over infrastructure priorities in the early days of the new NDP government. Notley also addressed the common perception that the NDP does not have a lot of support in rural communities. “That’s what people said before the last election too, and we actually have a large number of rural MLAs. People did vote for the NDP in a large number of different rural communities,” she said. Notley also addressed the ongoing controversy around UCP leader Jason Kenney’s leadership nomination and the so-called “kamikaze campaign” of Jeff Callaway, which has already seen tens of thousands of fines issued by Alberta’s Office of the Elections Commissioner for illegal donations. A southern Alberta judge recently ruled the investigation could continue despite the election. Dan Williams, the UCP candidate in Peace River, was originally on Jason Kenney’s Ottawa staff and assisted the UCP leader throughout the Wild Rose and Progressive Conservative party merger and his contentious leadership campaign. “We know the documentation from CBC that many, many, many people that were close to Kenney on his staff were very directly involved,” Notley said. “Here’s the bottom line. If Jason Kenney and or the people around him think it is OK to cheat to become the leader of a party and get a shot at being Premier, what exactly can we expect that they will do to stay in government? UCP leader Jason Kenney attended a fundraising event and a pipeline open house in Peace River with local UCP candidates from both the Peace River and Dunvegan-Central Peace-Notley constituencies prior to the writ dropping. There is no word yet if he plans to attend any upcoming local election events. And oil workers form about 8% of the workforce, but get 90% of Kenney’s time. The rest of the time he bashes GSA’s . LGBTP represent 2.5% of the population but seem to form 50% of Notley’s platform.